ON THIS DATE (October 16, 2008) ... It had been a lifeless game for the Red Sox, a lifeless game for their fans, the 38,437 out of a game that seemed out of the Sox' reach from the start. Some began heading for the exits before the top of the seventh inning. And those who did missed the magic. There is another game. The Red Sox, down 7-0, completing the second-biggest comeback in postseason history. The Rays, young and relentless, allowed the Sox back in. The Rays were nine outs from the World Series. Now the Sox, the kings of comebacks, have another shot. David Ortiz brought his team back into a game and a series that was seemingly over. It was a three-run home run in the seventh, bringing the Sox within 7-4, and the Rays were the ones suddenly reeling. It wasn't enough, but he didn't need to do it all. He left it to J.D. Drew, who singled on a line drive over the head of right fielder Gabe Gross in the bottom of the ninth inning. Drew sent the series back to Florida and had given the Red Sox cause to celebrate as if they had won the series, with a miraculous 8-7 win, staving off the Rays in Game 5 of the American League Championship Series at Fenway Park. While the Sox were outhitting and outscoring the Rays in the last three innings, Manny Delcarmen sat on the couch in the clubhouse. Delcarmen, who walked the only two batters he faced, was charged with both runs, leaving the Sox in a 7-0 deficit in the seventh. 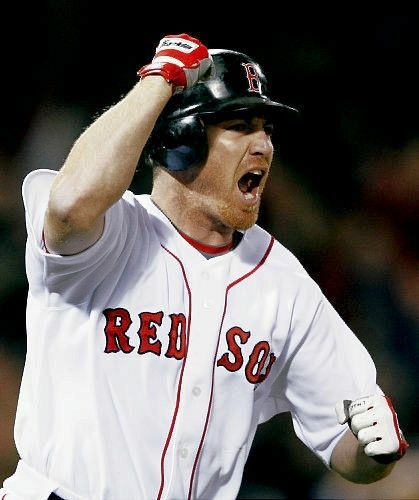 Then it was Drew's single, the ball bypassing Gross as Kevin Youkilis rounded third base and scored the winning run for the Sox. But before that, before the ninth inning, there had been more work to do in the eighth. So there was Drew, lofting his own homer into right, a two-run shot to cut the Rays' lead to 7-6. And there was Coco Crisp, who had a line single to right field on the 10th pitch of an at-bat that brought home Mark Kotsay with an improbable run. The score was tied. The score was indeed tied, and those Red Sox dreams and that packed luggage suddenly didn't seem all that ridiculous. With Jonathan Papelbon's entrance into the game in the seventh going from a stopgap measure to a rarefied decision, it was left to the rest of the Sox bullpen to hold down the Rays offense, author of 31 runs the previous three games. And it was left to the Rays bullpen, which had not distinguished itself in Game 5, to stop the resurgent Sox. So as Grant Balfour and Dan Wheeler and J.P. Howell followed the brilliance that was Scott Kazmir, the Red Sox climbed back into a game they had been out of. It had seemed there would be no comeback this time. No bloody sock. No flashing fastball of Beckett. The Rays, the mighty Rays, were proving a more formidable opponent than the Indians before them (2007), and the Yankees before them (2004). That, and the fact this team is a shell of former Sox teams. They were damaged and demoralized. They were ready for the end. Except they weren't. The Sox pitching staff allowed the Rays to continue to bash again. In 16 2/3 innings in Games 2-5, Sox starters gave up 11 home runs, starting with a two-run homer from B.J. Upton in the first inning last night. Hometown boy Carlos Pena hit a two-run shot in the third, and Evan Longoria went back-to-back with a homer to left. By the time the Sox emerged from the dugout to bat in the third inning, the Rays were up, 5-0, and manager Joe Maddon's questionable decision to start Kazmir over James Shields was looking pretty darn intelligent. Kazmir allowed two hits and had seven strikeouts in six shutout innings, a rebound from his first two postseason starts in which his ERA was 6.52. But it wasn't enough. Six innings left too many to the bullpen, even a bullpen that had been among the best in baseball for most of the season. It had seemed over when Kazmir was relieved by Balfour, but it wasn't. It was as wild, wacky, and wonderful as anything that's happened at Fenway Park in this century. Which is saying a lot.